After 5 years of marathoning, I decided that I wanted to tackle new challenges in 2014. There was a burning desire to get out of a rut and try another discipline that compliments my running addiction. This past Sunday, I added cycling to my race resume by participating in the Bridgeman104 Duathlon. Since learning to ride a bike in my childhood, I can't think of an occasion in my adult life where I've mounted a two-wheeler. One bloody nose dealt to me by the broad side of a boat (not joking) led to an avoidance of any vehicle without safety belts. I have, however, enjoyed more than my fair share of spin classes, so I felt my preparation for the bike portion of the race was adequate. After borrowing a bike from a friend last Wednesday, my first training ride was attempted on Thursday. That experience resulted in a broken bike chain and a renewed concern for my safety. A trip to Eastbank Cyclery on Friday had me feeling better about competing, and an evening trek on the Lakefront had me exponentially more confident. Less than 12 hours after completing the Crescent Connection Bridge Run, I was headed back to the Westbank to go over the bridge two more times. In it's third year in existence, the Bridgeman104 Duathlon was drawing nearly 400 participants for the early morning race. After easily parking in a garage near the start, I wheeled my bike to the transition area. Having executed the run leg in several tri-relays, I was familiar with the setup. Unfortunately, the transition was a bit chaotic, as each participant didn't have an assigned spot to hang their ride. After finally finding a spot to put my stuff, I stopped in at the Eastbank Cyclery tent for one last checkup. They confirmed that only user error could kill me. Being in transition surrounded by so many seasoned triathletes sporting much fancier bikes and equipment than I caused the only uneasiness of the day. However, the welcome speech from the race director calmed my nerves some, and his "first timer" specific seminar that followed for novice participants made me relax even further. Turning 30 has put me in the most competitive division of athletes, so we were the first ones set to take off at 7:15 a.m. 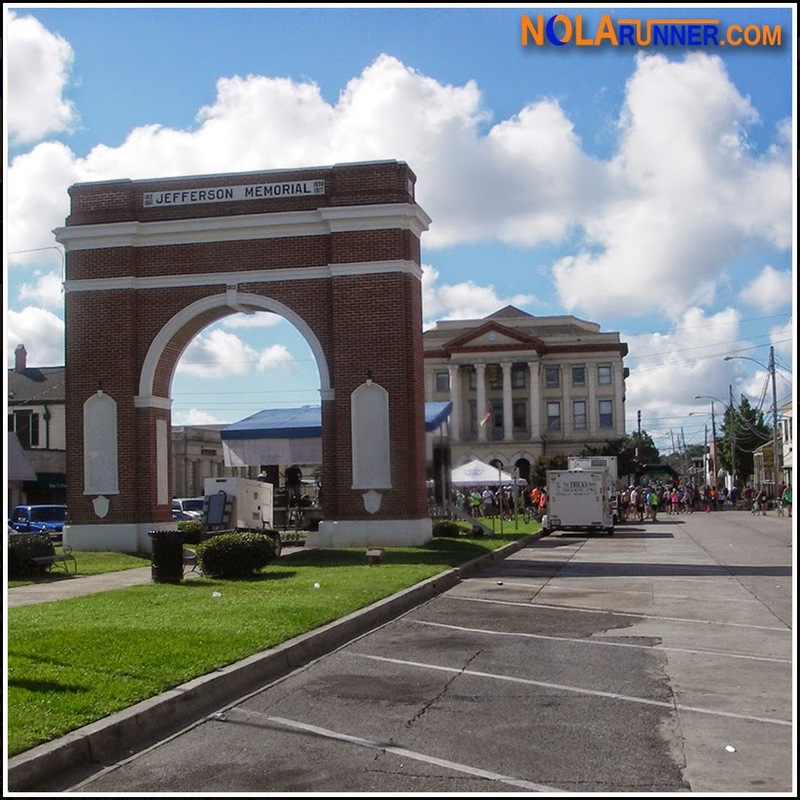 The first segment of the race is an easy 2 mile run through downtown Gretna. Not having spent much time there aside from a recent stint for jury duty, I was shocked at how pretty the area is. Residential, quaint, and welcoming. It's an interesting cross between Magazine Street and Small Town, USA. I was enjoying the first run too much when the 30-39 year old females started whizzing past me. That was a good incentive to pick up the pace. After completing my run, I sprinted through transition to find my bike, don my helmet, and run back out to the streets of Gretna. Soon after straddling the Huffy, I started getting the "On your left" treatment. My heavy seven-speeder couldn't keep up with the other participants, but I didn't care. I just wanted to get to the bridge, get over it and get back to where I started ... in one piece. A straight shot out of Gretna to the Westbank Expressway had me on the first incline to the bridge in no time. I was surprised at how easy it was for me to climb in the lowest gear, and while I was still getting passed by some amazing riders, I was pleased with my steady progress. The course was well marked, the turnaround was super easy, and the downhill was basically taken at a coast as my gears couldn't adjust to the forces of gravity. Pedaling would have been pointless. Also, the early morning views of New Orleans and the Westbank were incredible. Finally, after stashing my cycling gear, I took off on foot to the shores of the Mississippi River for a 2 mile sprint out and back along the levee. During this section, I was able to see friends who were also competing. I also felt great, as I had held back during the first two segments just in case I needed the energy late in the race. My final run was strong, and I crossed the finish line with ease. It was exhilarating to know that I could add "duathlete" to my resume, if that's even a word. Plenty of volunteers with handfuls of ice cold bottled water welcomed athletes at the finish. Timing chips were removed, and the post race party was waiting. Westbank eatery Gattuso's was serving up plates of grilled chicken breast, jambalaya, and salad, Smoothie King had blended beverages, and Budweiser provided open taps for participants of legal age. It was a great atmosphere, where everyone seemed to know everybody. The whole morning was a very supportive and community focused experience. Not having much previous experience in the realm of duathlons, my ability to critique is limited. I thought the race was really well organized and great for the seasoned athlete and novice alike. A more defined transition area with racks labeled by number for participants to hang their bike would have been very helpful, and it's my understanding this was the case in the past. Hopefully that will resume for 2015. Also, the lack of mile markers was noticeable in the first two mile segment and on the bike. Those would have been helpful to see distance covered and distance yet to go. 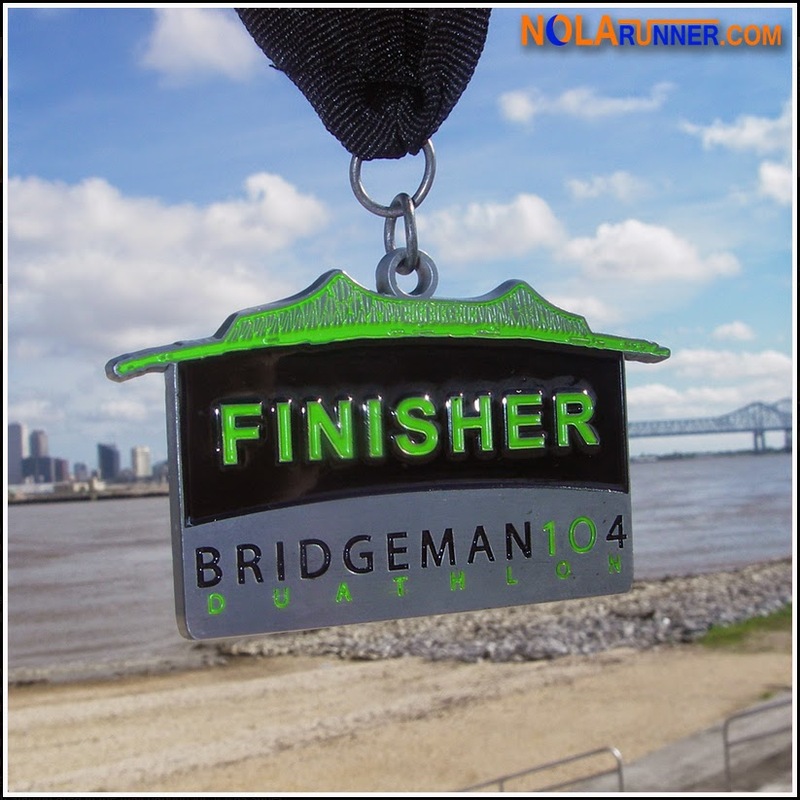 I'm still not sold on swimming in Lake Pontchartrain; however, after completing the Bridgeman104, I'm closer to being convinced that I could do a triathlon in the very near future. This was a great initiation to multi-sport events, and I never would have imagined going through the hazing process in downtown Gretna. For anyone contemplating a new challenge beyond your next 10K or half marathon, this is the obvious, and in my opinion, best next step. For complete race results from the Bridgeman104 Duathlon, click HERE. Check out pictures below from the Bridgeman104 Duathlon event. Thanks to Nicole C. for sending along a few for me to use! 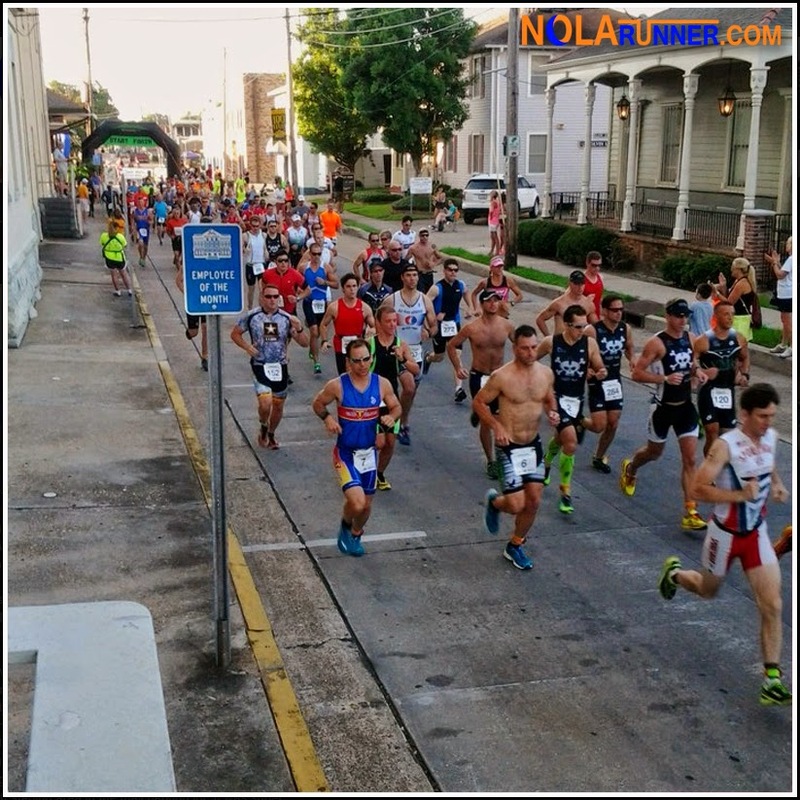 If you can't see the gallery of photos, LIKE the NOLArunner Facebook page HERE! My pleasure! Thanks for putting on such a great race. I hope to be back next year!